What wonderful family reunions this family must have. Herbert and Zelma have been married for 86 years. Both over were over 100 years of age when this picture was taken. They received a signed commendation from President Obama with a promise of an official invitation to the White House to meet him. 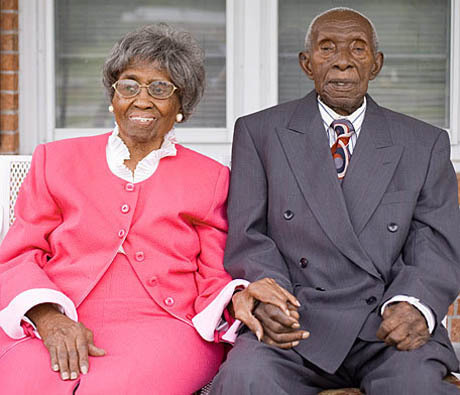 Does this handsome couple hold the Guinness World Record for the longest marriage of a living couple? Herbert and Zelma live in the home he built in 1942. They enjoy the visits of their grandchildren and great grandchildren. A testimony to the endurance of true love as written in a best-selling 1900 year old ancient guidebook: "love endures all things... love never fails" Congratulations Herbert and Zelma and Happy 86th Wedding Anniversary! For more tips on developing an enduring marriage read the closing 10 pages of our book "Fimark's My Keepsake Wedding Planner" an excellent gift for those recently engaged.